Paxos can be hot in the summer. Very hot. Meltingly hot. Lovely meltingly hot. Which is why it is so important to find one of those Paxos Hotels With Pool. On those long hot summer days on the Greek Island of Paxos there is nothing like a lovely cooling swimming pool to immerse yourself in and cool down. 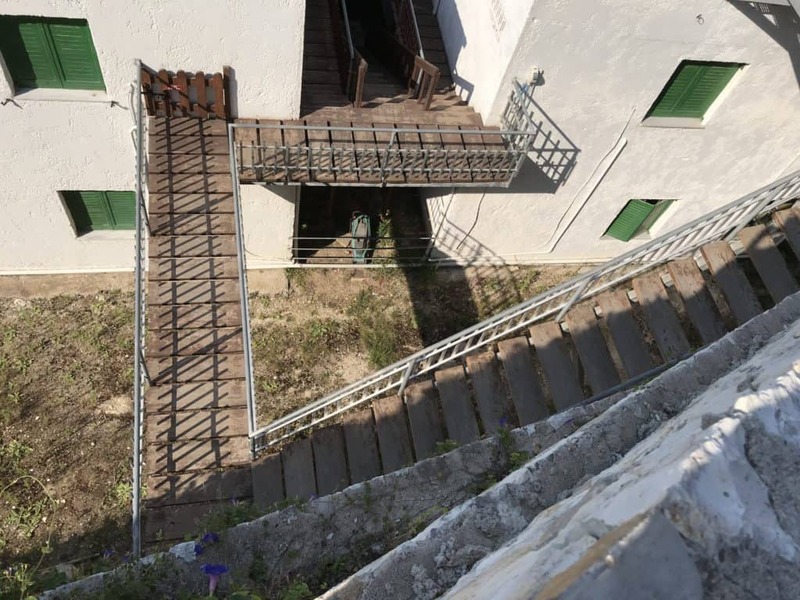 In this post I will tell you about my favourite Paxos hotel with a great swimming pool in a great location, and also list out the other hotels that I have found with pools. This is all about the pools and not the hotels – I will write a full post about our hotel of choice on Paxos. OK – I am biased as we stopped at Hotel Bastas twice. But the fantastic swimming pool is a big part of the appeal of the hotel for me. The pool is located at the back of the hotel and is actually above the hotel. You have to walk up some steps and across a small footbridge to get to the pool would you believe! This elevated position gives evening sunbathing possibilities not possible in most places on Paxos due to the topography of the island. Down in Lakka itself the sun sets over the top of the hills to the west a good 30-45 (ish) minutes before it does at the elevated pool. If you like late afternoon sun this is the place to be. Most pools will be in shade while the pool at Hotel Bastas is still getting that lovely late afternoon sunshine. And I love my late afternoon sunshine – it is my favourite time of day for some very relaxed reading with a couple of chilled beers. More often than not I have spent some part of the day exploring and taking photos, so later afternoon/ early evening is the time to relax for me. This is probably why I don’t have as many sunset photos as I do sunrises! What does the pool at Hotel Bastas have? Firstly, a good-sized swimming pool. The pool has steps at the bar end where people sit and chat or read, and then it gently gets deeper. There are plenty of sun-loungers, table and chairs. And there is covered seating if you want a break from the sun. I used this area for morning writing with a coffee in the shade – very handy! Then there is the bar when you can get drinks and food. We ate there a lot I have to say, and I did have rather a lot of lovely cold beers there. There are tables which have a charming roof of growing grapes which is lovely. The lunchtime fare is great snacky stuff that I really like, especially the pan-fried hot dog sausages. And the prices are absolutely fine. Beers, wines, spirits – everything you could want. And water too! And there are the most amazing trees at the end of the pool – one of them looks like it is going to get you!! This is one of the best pools I have had the good fortune to enjoy on my travels around the world. I love the elevated position and the views down into Lakka and the waters beyond. And on a practical point there are toilets and showers down the steps underneath the pool. So that is my favourite Paxos Hotel with a pool. And you really do not need to leave there at all in a day if you don’t want to! What other hotels on the lovely Greek Island of Paxos have pools then? As you will see this is a small list. There are not that many hotels on Paxos to be honest! And even less hotels with pool. Apparently there are 65 hotels in Gaios, but most of these are aparthotels. And this is a great alternative to a hotel on Paxos – aparthotels with pool. Check out this search using Google – there is lots of choice out there – too much for me to include here. Hotels in Paxos it turns out are hard to find. Hotel Bastas is a great starting point, but there is one other place I would like to mention. If you are reading this I assume that you are looking for somewhere to stay on Paxos with a lovely pool. Well I have listed the hotels that I know of on Paxos with pools and suggested that aparthotels are a great alternative search choice if you are looking for something different. 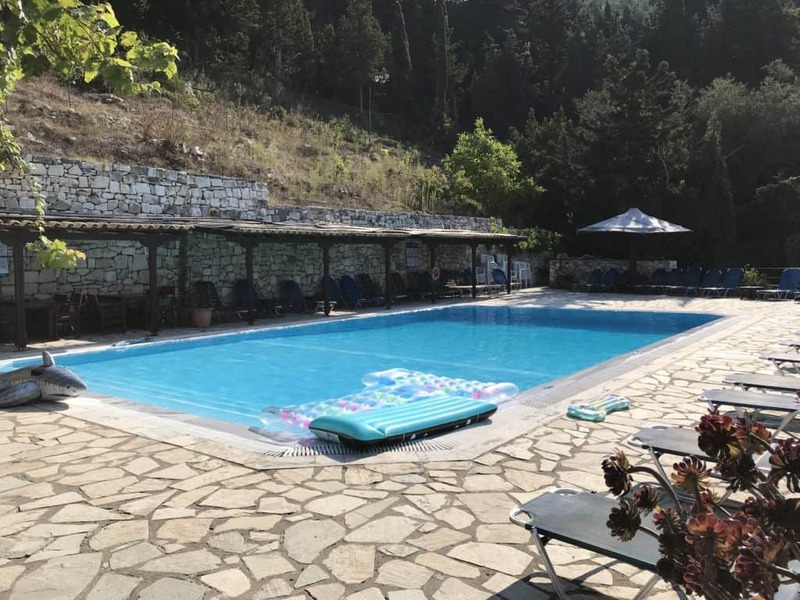 But there is one other place that we can personally recommend if you are looking for a great location for a pool on Paxos. By hire car, or by bus with quite a long walk! But from Hotel Bastas you can get a free bus to Manandendri Beach. This is a lovely if pebbly beach. There is a restaurant there called ΜAΝΔΕΝΔΡΙ BAR RESTAURANT which you have to walk through from the car park to get to the beach. We had lunch there one day which was fine. The pool was busy and full of kids – nothing wrong with that but we prefer something quieter. So, if you walk through the restaurant and turn right you come across the entrance to the very nice Glyfada Beach resort. This is not a hotel but has very nice holiday villas. All are welcome to have lunch there, which we did, which was very nice. All you do is walk up to the restaurant from the beach and ask for a table – everyone is welcome. And there is a big bonus to this. Glyfada Beach Villas have an excellent pool. We were lucky enough to be allowed to use it one day having had lunch there on a day out at the beach. As I said we went on the day trip from Hotel Bastas to Glyfada Beach. We spent some time on the beach. This was my favourite spot on the island for snorkelling – I went from the beach off to the right and there were some great rocks to jump off into the sea. And if you swam around the corner there was a private beach with some lovely big boats visiting. You know the ones – all dark and expensive and lovely! But back to the pool at Glyfada Beach. After lunch we asked if we could use the pool, which was up on the hill over looking the beach. That was not a problem, so we headed up to the pool to find it was completely deserted. We made ourselves at home on two wonderfully located sun loungers and had a very relaxing afternoon. The pool was lovely, and there is a bar by the pool, so all was good. We reluctantly left for the bus back at 5 having had a very nice relaxing afternoon by the pool at Glyfada Beach. As you will see we loved the pool at Hotel Bastas – the unique location makes this in my opinion the best pool at a hotel in Paxos! This is based on personal experiences of us visiting the island of Paxos – and none of my recommendations are in any way sponsored. At the time of writing this I am sat in the UK as a paying customer looking forward to returning to the wonderful Greek Island of Paxos. Next PostNext Paxos Mobile Phone Signal – And What About WiFi?